Strangely I saw this on Ewan’s instagram, it led me to a google form which looks like it is gathering reports of TeachMeet to a book that will be given away on a Creative Commons licence, with donations to a children’s charity encouraged. How has TeachMeet changed your teaching or learning? What is the one memorable talk or conversation you had? What is the most profound change you’ve seen in your classroom? 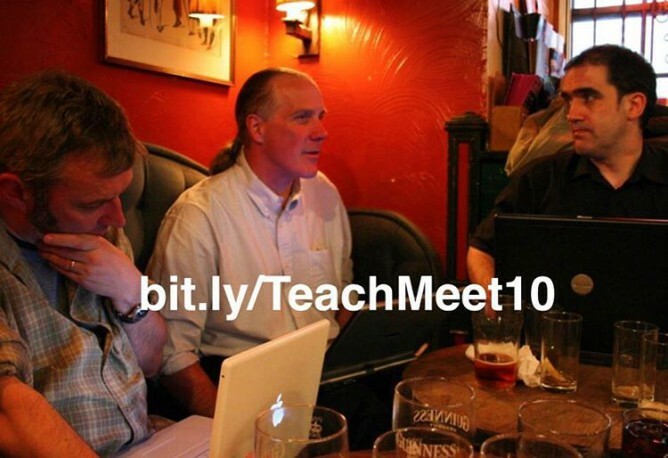 Tell us here, and be part of the TeachMeet 10th Birthday book! How did TeachMeet make an impact in your world? Tell your story. Be passionate. Who influenced you? Who did you meet? What was the result in your learning or teaching further down the road? About 10 years ago I went to The ScotEdubBlogger Meetup that kicked off the TeachMeet movement. It has have a pretty big effect on my learning and life. When TeachMeet started it seemed like something completely different and it chimed with ideas that I was starting to think about then and have been thinking about ever since. To me TeachMeet had some interesting components. These might not be the same for other people and they are certainly out of step with the way that some TeachMeets have developed. TeachMeets were a reaction against conference sessions and keynotes where a Guru talked through a slide deck for an hour. The idea was that everyone who turned up was willing to talk if their name came out of the picker, for 7 or 2 minutes. There were no keynoters and no one came first or was guaranteed a spot. There was no PowerPoint, this is an oft broken rule, the spirit, IMO, is that you don’t read your way through some sets of slides. If you were not interested in the current speaker you were free to have a chat. The atmosphere was relaxed, a few drinks and nibbles. Lead by Ewan, these ideas were developed, influenced by BarCamp. The first few events, felt incredibly exciting. We talked like maniacs, posted photos, wrote blogs posts. There was a fairly strong tech bias, but the mantra ‘It is the teach not the tech’ was chanted. The change it made in my classroom was not so much the ideas I gathered from others but the the idea the teachers could make decisions about how they did things and gave me confidence to follow my own ideas. I felt they echoed the way blogging seemed to be developing. People expressing their own views, organising themselves from the bottom up, democratic, without hierarchy. There were influences from the OpenSource movement and the tech world too. Blogs posts, flickr photos links in delicious were tagged and could be aggregated. For me it is mixed with ideas of sharing, creative commons, openness and fun. It fitted with my growing interest in Open technologies and OER. If I was to condense what I have got from TeachMeet it would boil down to the idea of doing it for ourselves1, owning our own spaces and sharing freely. On the back of this trip down memory lane comes the idea of rebootingTeachMeet in Scotland: TeachMeetScot from Fearghal Kelly. There is a lot of interest and interesting comments on that post and in a response by Robert: Teachmeet+ | Learning Stuff About Stuff. Now maybe the point of Teachmeet is to embed the good practices in the classroom of the presenters themselves. This seems more likely. I think that might apply to me. If so, we should return to the principle that Teachmeets are for presenting, not for listening. This speaks to the second bullet above. It also hints that we need to get away from old hands organising or running the meetings. TeachMeets were in part a reaction and need to continue to be just that. In a follow up post Fearghal explains that he can’t organise TeachMeets himself. Perhaps those of use who have and could should step back a bit. Old hands could do the boring stuff 2, but hand over to a new set of not only presenters but the chairperson’s role too. Morning John. I write this on the last day of term! ever since I started attending teachmeets I’ve been conscious of the fact that at many I learn new things or new ways to do old things. I’ve also tried to present at some in Edinburgh, Glasgow, Stornoway and Inverness. The last one was the SLF get together in Citizen M hotel which was great as it was so relaxed and the free pizza/sushi helped people who just wanted to sit and chat rather than sit politely listening to the greats like Kenny Pieper, Ian Stuart and so on. I’m not sure whether we should now be thinking about just facilitating a location, IT facilities and scoff and just let people sit down for a couple of hours with a beer and just TALK. Maybe set up wee talk circles/round tables? We tried that at Strathclyde Uni one Saturday where people just rotated between rooms according to what took their fancy regarding what was happening in each room. They could also swap ‘stuff’ – I always come away from teachmeets with new resources so long as I remember to take a flash drive or two and am always happy to bring along all my stuff for people to copy/select what they want. In summary, a location with decent facilities, LOTS of people attending in a social rather than formal ‘teaching’ atmosphere and the ability to talk/exchange ideas and resources. Mind you I tried that in Inverness years ago and 7 people turned up! I am always grateful to those who organise these things and the likes of David Cameron for coming along and invigorating us all – I need a dose of David at least once a year to keep me going in teaching! I hope you add that to the TM book. This is a great idea if not really thought through. At CitM we wanted to get back to the idea you could ignore the speaker and chat to neighbour which was an original principal of TM.